He may look goofy, but maybe he only dresses like this so you'll underestimate him. Psyche-Out got his degree in psychology from Berkeley and worked on various research projects involving the inducement of paranoia by means of low frequency radio waves. Posted to the Psychological Operations Command at Fort Bragg, he continued his pioneering work in the field of wave induced behavior modification. Since joining the GI Joe team, he has led numerous classified PSYOP and Military Support Operations (MISO) against the legions of Cobra. While destroying enemy assets is crucial to any battle, it is the psychological struggle to persuade, change and influence their minds that seals the victory. With complicated thinking and multiple layers of deception, along with using portable transmitters to hijack enemy broadcasts and relay misinformation, Psyche-Out already has them doubting their loyalty before the first shot. By the time the smoke clears, enemy soldiers are often begging to be taken prisoner. This figure is only somewhat new: the exclusive box set available at the 2013 International GI Joe Convention was "Operation Nocturnal Fire," a Night Force-themed set that gave us our first legit Generation 3 updates of several characters who had been part of Night Force back in G1; one of whom was Psyche-Out. Below the neck, all his parts are reused. He has the same torso as Barrel Roll, reused from Pursuit of Cobra "Desert Battle" Duke. In fact, all his parts come from that Duke - even the Zartan legs. The high tech armor on his chest and back may have an entirely different design than the 1987 toy, but the spirit is intact, and that's what counts. The head is new (or at least, it was when it debuted in the JoeCon box set, so we're still counting it). 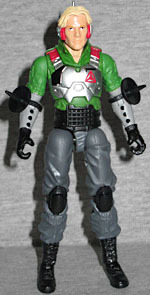 And since it's new, it's a true update of Psyche-Out's original toy, not just a clever repaint of some other character. Good thing, too, since no one else had his Lobot-style headset, or his floppy blonde hair. He kind of looks like Clint Barton, but not as dour. Since the head is the only new piece, the paint has to do the heavy lifting in making this toy look like the one from 28 years ago. He's got a bright green shirt, dark grey pants, red straps holding his chest armor on... it's a good homage. Since Duke was wearing short sleeves, Psyche-Out's long gray sleeves are just a matter of paint, not sculpt, but you can pretend it's some kind of fitted undershirt. There are three black dots painted on each forearm. No idea why, but the original had the same thing. 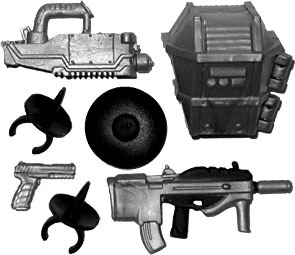 Part of the reason we could guess that the Nocturnal Fire figures would appear again in non-Night-Force colors was that it would help defray the cost of the new parts - in Psyche-Out's case, the tiny radar dishes he wears on his elbows, and the larger one on his frequency generator (which is actually just a gray version of Airtight's DIM sniffer with a radar dish plugged on the front). 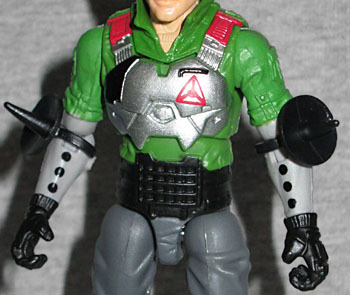 He's also armed with a small gray pistol, a Resolute submachine gun, and Zartan's backpack, for some reason. His dishes are black, rather than red; meanwhile, the Night Force version had red ones instead of black. Maybe you can find someone willing to switch. Psyche-Out is a prime example of how much of an impact Larry Hama had on GI Joe as a brand: the design is totally goofy, but the personality and skills (as presented on his filecard) are totally a real-world thing, and a massively important part of war today. It's easy to see why Hasbro would think this figure didn't belong on store shelves, but then again, who knows? Clearly a thousand versions of Duke and Snake-Eyes didn't catch kids' imaginations, so would Psyche-Out have really been so much worse?